One reason to make what is now the long walk to the tip of Spurn Point (now that the road has been washed away) is the fun of ship watching. As vessels round the point, a trick of perspective brings them so close you feel you can almost reach out and touch them. As an added bonus, these days one can look up the ships on the internet and, with just their name, find out what they are, their details, their points of departure and their destinations. The ship pictured above is one Pete photographed last time we were there. 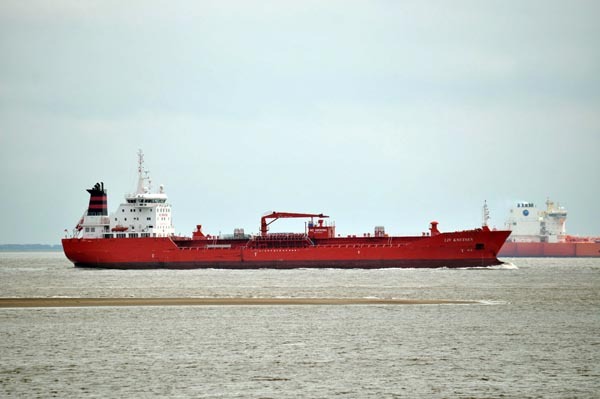 She's the MV Liv Knutsen, a chemical/oil products tanker of gross tonnage 11,889 tons. She was built in 2009 and is currently flying the Red Ensign. When we spotted her – to my recollection – she was on her way to Goole, outbound from Rotterdam, carrying a load of chemicals. Her presence reminds us that trade to the Continent is by no means confined to trucks and containers. There is a healthy two-way flow of bulk cargoes, of which chemicals form a significant part. Together with pharmaceuticals, with which chemicals are grouped, UK exports to the rest of the EU amount to some £50 billion annually (slightly more than half is attributable to chemicals). The combined value is nearly a quarter of our total exports to the EU (£223.3bn in 2015). Unsurprisingly, therefore, the EU's Single Market is extremely important to the industry – especially as manufacture and trade is heavily regulated through Regulation (EC) 1907/2006 concerning the Registration, Evaluation, Authorisation and Restriction of Chemicals – the so-called "REACH" regulations. To describe fully the workings of these highly complex regulations is beyond the scope of even a series of blogposts, but the crucial thing to be addressed currently is the impact of Brexit on these regulations and through them on the industry as a whole. In this context, the lead policy of the UK Government is to rely on the Great Repeal Bill, in which respect these regulations might be repatriated to serve as UK law. However, as we found with the fishing industry, this might not be as straightforward as originally thought, both in domestic terms and in relation to post-Brexit exports to the EU. As far as their domestic application goes, the big problem is that the regulations concern themselves not just with the technical standards applicable to chemical products, but to an EEA-wide system of regulation, centred on the European Chemicals Agency (ECHA), which is responsible for managing the system. Here, one recalls that, in the CFP policy regulations, one could not simply remove references to "Member States" and other Union-specific terms and replace them with UK equivalents. Likewise, with the REACH regulations, the same problem is found. Without substantial re-writing and restructuring, it is hard to see how they could be made to apply to the domestic industry – rather defeating the purpose of the Great Repeal Bill, or reducing its value. Nevertheless, such is the complexity of chemical regulation that, in this particular case – and unlike fishing - even modifying the 505-page document might be easier than starting afresh. At stake is regulatory convergence and, without using REACH as the regulatory base, UK companies would have considerable difficulty exporting to EU Member States. Such is the impact of this regulation that South Korea, despite enjoying a comprehensive free trade agreement with the EU, has found it necessary to abandon its own regulatory model and adopt the substance of the EU regulation in what is called the Korea REACH. This, in itself, is illustrative of the position in which the UK will find itself – even in the unlikely event that it is able to conclude an FTA with the EU. Far from being able to pursue regulatory independence, it will be drawn into the gravity well of its more powerful neighbour. The FTA and the adoption of the EU regulatory model, however, does not enable South Korea to export to the EU, and nor will the UK be in any better position. The problem is in the very essence of the regulations, which will be left untouched by the Great Repeal Bill. This "essence" requires all manufacturers producing chemicals in quantities exceeding one metric ton to register their products with the European Chemicals Agency, providing extensive safety details of the chemical they produce. As registrants, they must then supply on an ongoing basis details of quantities produced, and the amounts despatched to distributors and "downstream users". For as long as the UK remains a member of the EU, "REACH compliant" UK manufacturers will have to maintain their current registrations with the ECHA but the moment Brexit kicks in, all this changes. The definition of a "manufacturer" within the context of the regulations is taken as "any natural or legal person established within the Community who manufactures a substance within the Community". With the UK no longer a Member State, its manufacturers will no longer be established within the Community (or Union) and nor will they be manufacturing within the Community. Assuming the status of non-Community manufacturers, they are no longer permitted to register their own products or supply information directly the ECHA. These responsibilities have to assumed by the importers, which can be either EU-based distributors or users, if they purchase directly. Alternatively, to avoid deterring potential buyers or distributors, the UK's non-Community manufacturers may appoint what are described in the regulations as "only representatives", which must be based in the territory of an EU Member State. These then assume all the responsibilities of registrants, as set out in the regulations. No country outside the EEA, whatever their status, can escape this provision. Even manufacturers from the mighty USA are caught, provisions which add cost and complexity to exporting chemical products to the EU. Currently, of the 48,000 registerations, nearly 6,000 are attributed to UK companies, covering nearly 2,500 products, making the UK the second largest in the registration league. Come Brexit, though, all those registrations will most likely lapse. UK companies will need to appoint suitably qualified "only representatives" who in turn will have to submit nearly 6,000 registrations for their clients. Obviously, if the UK negotiates a managed departure, with plenty of notice and a timely transitional agreement, then the new registrations will doubtless be phased. We can enjoy continuity of trade and MV Liv Knutsen, amongst others, will be able to maintain its schedules. On the other hand, if Mrs May "walks away", literally overnight what would otherwise have been an orderly process will become a mad scramble. Manufacturers would face a short-term collapse in trade, with an uncertain recovery. They would be entirely dependent on the willingness of the ECHA to commit sufficient resources to processing a high volume of new registrations. Additionally, as an ongoing issue, there will be the problem of securing registrations for new products which come onto the market, adding time and complexity to the process of exporting to the EU. Then there is the altogether far more complex issue of "Substances of Very High Concern" (SVHCs), which require separate authorisation. As the highly dynamic REACH regulations change, the UK will have to provide evidence of continued compliance with each amendment, in order for its existing products to be given continued access to the markets of EU Member States. Given the highly competitive nature of the chemical industry, only a wild optimist might suggest that trading levels would be unchanged. In the event of Madam May going walkabout, the losses could be very substantial. In the worst case scenario, they could amount to tens of billions. The more cordial and measured the negotiations, the smaller the losses are likely to be. But there can be no dispute that the stakes are very high. It will take more than a Great Repeal Bill to make things right.